Probiotics – Should you take one? According to the most recent National Health Interview Survey (NHIS) survey, 3.9 million U.S. adults use probiotics or prebiotics. Projections for future probiotic use are even higher. The popularity of probiotics is unquestionable, but what does the science say? With the topic of probiotics on everyone’s mind, we asked two Cooper Clinic experts ─ Director of Gastroenterology Abram Eisenstein, MD, and Registered Dietitian Nutritionist Gillian Gatewood, RDN, LD, CNSC ─ to unravel the role of probiotics in the American diet. 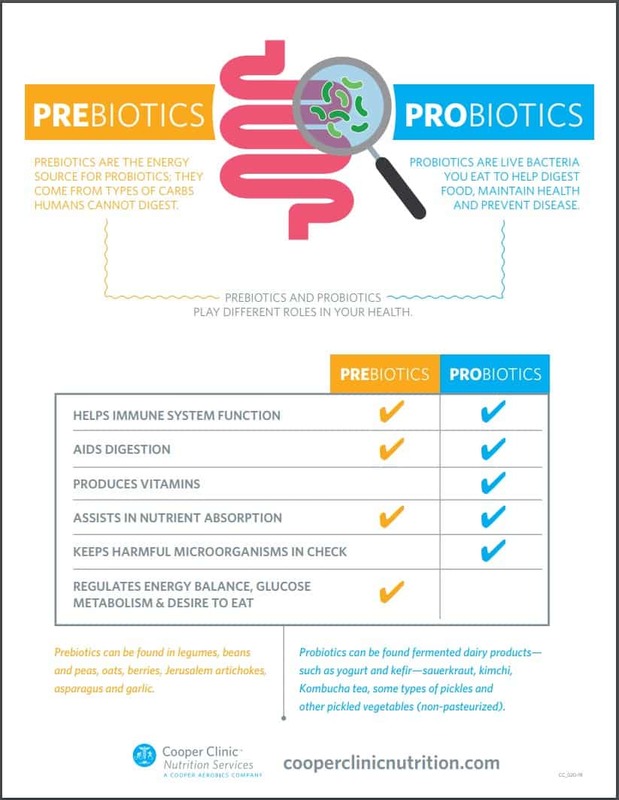 Nutritionists at Cooper Clinic have helped create an infographic to better understand the difference between probiotics and prebiotics and their role and function in the body. Click on the infographic for the full sized image. Dr. Eisenstein emphasizes two important words and concepts: Supplemental and Therapeutic. 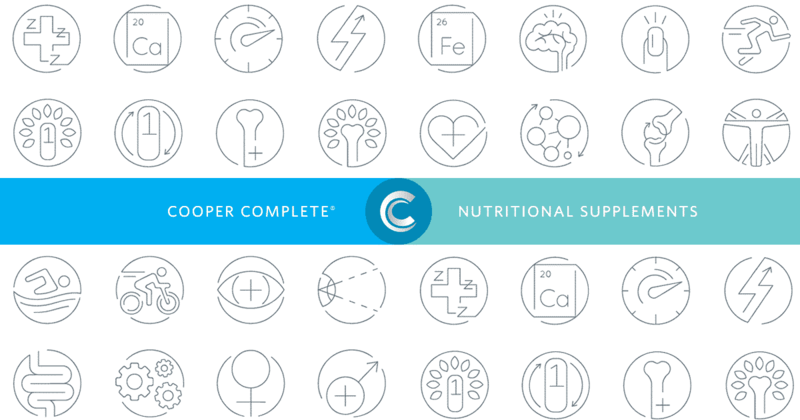 Supplements by definition are not meant to replace a healthy diet, but instead address nutrient deficiencies and fill in nutritional gaps; to supplement one’s diet. At this point, scientific research indicates that probiotics are therapeutic not supplemental, meaning they are used in the treatment of disease or disorders. Current positive probiotic research is condition-specific, addressing specific illnesses such as irritable bowel disease (IBS), antibiotic associated diarrhea, C. difficile infection or ulcerative colitis to name a few. Probiotics require a different way of thinking than tangible over-the-counter products because of the live bacteria. When one consumes a probiotic, they are consuming a living organism. “The implication of what that might do or not do for your health is much more complex,” Dr. Eisenstein explains. For example, if someone has a vitamin D deficiency, a doctor can test the patient’s vitamin D blood level, determine the deficiency level and then test the blood again after starting a vitamin D supplement regimen to see if it has resolved. Probiotics, however, don’t work this way. The organisms are biochemically and physiologically changing the gut. The human gut contains more than 500,000 bacterial strains. Identifying specific probiotic strains or combination of strains that provide health benefits is only one piece of the puzzle. The quantity of probiotic ingested is also a factor. Is more probiotic better? The answer has not been verified. In fact, research is still unclear if it is the bacteria itself that offers benefits. The benefit may come from the bacterial products made by these living organisms. To make the matter even more perplexing, there are thousands of other molecules in the human gut other than bacteria (viruses etc.) that are widely unknown. The complexity of the microbiome and probiotic impact is unimaginable. An incredible number of variables still exist today that scientists are still working to detangle and fully comprehend. Aren’t there studies showing probiotics are helpful? “Probiotics are an example where we have gone beyond the science and just started marketing,” stated Dr. Eisenstein. In fact, many verifications and seals of approval aren’t based on scientific research, but rather, purely marketing. Many companies can pay for such seal of approval. Several studies identify that a certain condition has a different microbiome than if the condition were not present; however, this begs the question ‘What came first the chicken or the egg?’ Was the change in the microbiome a cause or result of the condition’s presence? “Even as recently as this past month, the literature I read and see almost invariably ends with ‘We don’t really know. More studies are needed,’” explains Dr. Eisenstein. The overall body of research leaves us with a constant cliffhanger. A probiotic product may help, but more studies can provide clarity either way. Does Cooper Complete offer a Probiotic? Customers regularly ask the Cooper Complete service team this question and right now the answer is no. The reason that a probiotic product is missing from our supplement shelf is certainly not for lack of market. Cooper Complete formulates new products very methodically based on proven research, not media trends. Before a new product is offered, our team of doctors and researchers meticulously review the scientific evidence determining if the supplement is beneficial for optimal health. Will Cooper Complete formulate a probiotic? Maybe someday. Our team of researchers and physicians will keep a close eye on the science as it unfolds. Dr. Eisenstein and Gatewood agree that the microbiome and issue of gut flora is undoubtedly one of the most exciting and potentially impactful areas of 21st century medicine. The emerging science could have tremendous impact on health – both from a therapeutic standpoint as well as preventive. This area of study could not only affect gut health, but preliminary findings imply a potential impact on brain health as well. For now, Gatewood emphasizes obtaining helpful probiotics through natural food sources such as yogurt, kefir, sauerkraut and kimchi for general health. Ensuring these food types are part of your regular diet has an added benefit as they are also good sources of calcium.